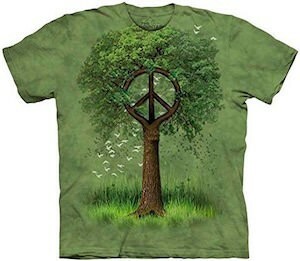 If you want to be good for the world then wear this Nature Doesn’t Need People T-Shirt. We all know that people are great at making a mess of the world so maybe we should keep them out of nature so that they can’t mess that up. 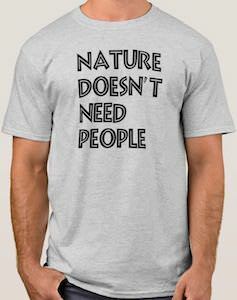 On this t-shirt it simply says “Nature Doesn’t Need People” and that message is clear. You can get this t-shirt in many styles for both men and women and it is available in many sizes and colors so that it is just perfect for you. This t-shirt shows the world around you to reconnect with nature. 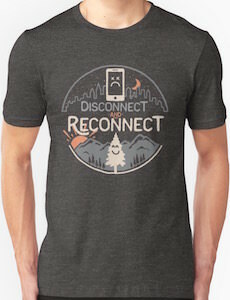 On this t-shirt you can see a circle with in the top of the circle a city and you unhappy mobile phone and below that scene it says “Disconnect” and below that it says “And Reconnect” and then you see nature with mountains and a happy tree. Of course being outside enjoying the sun and the trees is so much better then seeing what your friends are up to on snapchat or Facebook. You can get this t-shirt in many styles for both men and women and if you like a brighter color then the grey of this shirt then you are in luck to as it is available in many fun colors. A holiday at the lake is always great but when it’s over then things get bad. But now you can always have the lake with you as it is printed on the this t-shirt. 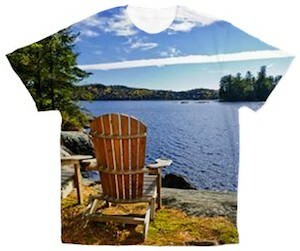 The front of this t-shirt shows a photo of a lake and yes it even has a nice chair from witch you can enjoy the view. And this photo t-shirt comes in sizes Small – 2Xl to make sure the lake will fit you the right way. No need to go on holidays to the cabin any more because the view can be with you all the time. Come and get your own View Of The Lake T-Shirt.